Richard Rowland has worked from his studio on the Westside since 1998. His latest show at Vaila Fine Art contains prints from his travels in Iceland and the Faroe Islands and other recent work. This exhibition at Vaila Fine Art is of new works by Peter Biehl, a Danish artist intermittently residing in Tresta. 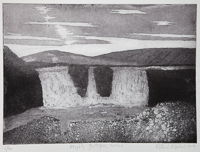 An exhibition of etchings by Richard Rowland. The new exhibition of drawings and prints by Ron Sandford opens on Saturday 18th July at 6 pm at Vaila Fine Art in South Commercial Street, Lerwick. New paintings by a much-admired Shetland artist, Joyce Wark, are exhibited at Vaila Fine Art in South Commercial Street from this Saturday 22nd November. This is the much-anticipated third exhibition by Joyce at this gallery and the 19 paintings are the result of two years’ work. The artist admits that each painting now tends to take longer to complete than in previous years. 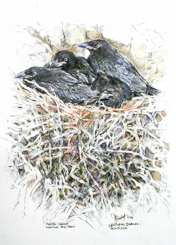 An Exhibition of Howard Towll’s paintings and drawings of the wildlife and landscape of the Bridge of Walls area. Towll has lived in Shetland since 1991 and worked as a Ranger for the Shetland Amenity Trust for the past eleven years. A keen ecologist, he describes himself modestly as not trained and self-taught, saying, “ I just drew what’s there”, but the works on show imply a lifetime of persistent, disciplined observation of nature and considerable familiarity with the creatures’ anatomy and habitat. 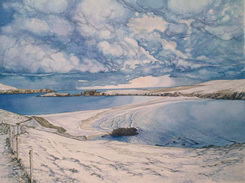 A much-admired Shetland artist, Joyce’s watercolours are mostly landscapes surrounding her home in South Mainland, beautifully observed and executed with gradually maturing technique. Joyce relies on photographs as a tool of her craft but her pen and brushwork surpasses any enhanced electronic image definition. 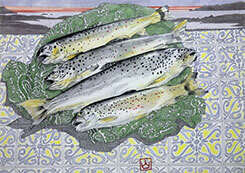 This is the second exhibition by Joyce at this gallery and the 29 paintings are the result of two years’ work. Read full press release. 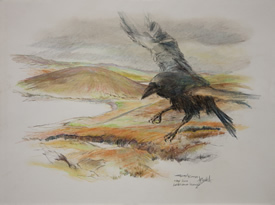 Visit paintings for real in our Shetland gallery, or preview online images. Information on previous exhibitions at Vaila Fine Art. 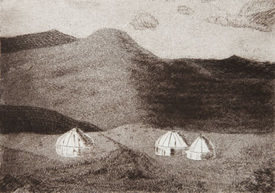 An exhibition of etchings by Richard Rowland of his travels from Lerwick to Mongolia in the 2011 Mongol Rally. We all know Brian Henderson and his ability to amaze us with his precision of execution of photo-realistic paintings in acrylics, his eclectic choice of subject matter and his consistent vision of the better aspect of life. This new work is sharp, crisp and engaging. There is immaculate fruit, well polished glass and freshly laundered table linen. 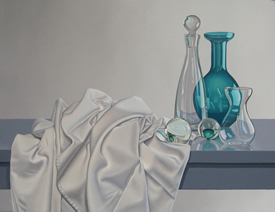 Brian’s delight in depicting the carefully chosen object in brightly lit interiors is evident in every picture. His virtuosity in concealing individual brushstrokes is as puzzling as ever. “May to October” is the current exhibition at Vaila Fine Art and features new works by Peter Biehl, a Danish artist living in Tresta. These immediately recognisable drawings of wildlife by Peter Biehl will be familiar to the Shetland public. Subjects are all painstakingly observed, captured on a particular day in their habitat, selected for their personal appeal to the artist and masterfully executed. Mixed media constructions, available to view and buy in the Lerwick gallery from June 2011. 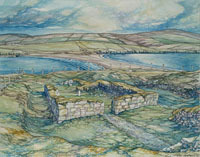 Paul Bloomer’s work has been well known in Shetland since 1997. 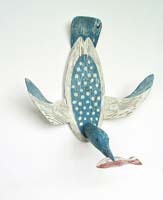 His strong images of birds and highly stylised island communities are immediately recognisable. December - January. 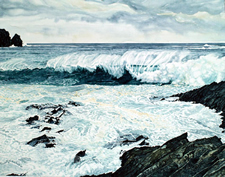 An exhibition of 15 different professional artists working in Shetland: Peter Biehl, Ruth Brownlee, Paul Bloomer, Claire Dalby, Peter Davis, Dave Donaldson, Mike Finnie, Gail Harvey, Brian Henderson, Mike McDonnell, Roxane Permar, Richard Rowland, Ron Sandford, Meilo So and Joyce Wark. 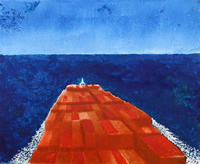 Exhibition of new linocuts and drawings by Ron Sandford. View Ron Sandford's exhibition. Read more about Ron Sandford's art here. New paintings from Africa by Peter Davis. 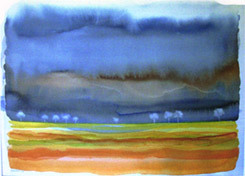 A few examples of watercolours from this exhibition.